Triple cancer survivor Nick Edmund has set off on his third charity golf-walking marathon, this time around Northern Ireland. 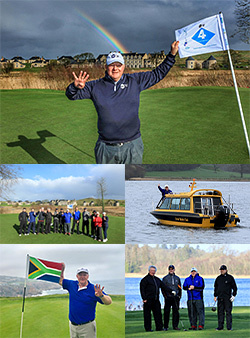 The redoubtable golf industry veteran began his latest epic venture to promote cancer awareness at the weekend at Lough Erne Resort, a location close to his heart as he was instrumental in the resort’s Nick Faldo-designed course while he was Managing Director of Faldo Design. Plucky 58-year-old Nick will spend the next four weeks walking with a golf bag on his back and visiting 20 golf courses across Northern Ireland, undertaking the challenge in four stages and visiting leading clubs including the Causeway Coast’s Royal Portrush – host venue for the 148th Open Championship in July – to play the 4th hole and plant the now-iconic 4-Flag of his Global Golf4 Cancer campaign at each one, before finishing at Royal County Down at the end of March. Along the way, Nick will also visit UNESCO World Heritage Site the Giant’s Causeway, walk across the nearby Carrick-a-Rede rope bridge, take a 40-mile train trip from Derry to Coleraine described by Monty Python star and TV travel presenter Sir Michael Palin as one of the world’s great railway journeys, walk though the Dark Hedges avenue of beech trees that feature in TV series Game of Thrones and stroll the streets of Belfast city centre – all with his golf clubs on his back. Nick began his gruelling Northern Ireland golf-walk just nine days after returning from an “Arabella to Zimabli” tour of South Africa, during which he visited 18 top golf venues including Durban Country Club, Royal Johannesburg & Kensington Golf Club and the Sun City, Fancourt, Arabella and Zimbali golf resorts. More remarkably, it is less than six months since he underwent major surgery and radiotherapy for his head and neck cancer. He even took a four-week break in his last golf-walk, from Turnberry to Royal Dornoch around Scotland’s links courses, for the radiotherapy treatment after an operation to remove a tumour on his forehead. Nick says the 18-club tour, to four regions of South Africa, was to introduce the campaign to the country and adds that he was “absolutely blown away by the reception” from golf clubs and the golf industry to Global Golf4 Cancer and his awareness campaign. The courses have all said they intend to fly the 4-Flag for four days from 4 April, “the 4th of the 4th”, as well as raising it one day on a quarterly basis throughout the year. Another highlight for the start of his Northern Ireland golf-walk was that the American owners of Lough Erne Resort flew in to meet Nick and offer their support. He then boarded a water taxi from the resort to cross the lough, dodging the worst of Storm Freya, and continue with the walk. That is being broken up into four segments: from Lough Erne to Derry; the Causeway Coast; from Lisburn to Bangor, taking in Belfast; and from Clandeboye to Royal County Down. During the journey Nick will play the 4th hole and raise the flag at courses such Omagh, Newtownstewart, Castlerock, Portstewart and Ardglass in addition to Royal Portrush – where he also hopes to play the celebrated 5th hole that ends with the green on a cliff edge – and Royal County Down, the par-3 4th hole of which Nick describes as one of the two most iconic 4th holes in Ireland. “It is going to be a magical to place to finish the walk, just as the 4th at Old Head was for my Wild Atlantic Way walk,” Nick says, referring to his first marathon when he visited 40 golf clubs on a two-stage, 2,000km golf-walk around the Irish coast. Nick is not putting his feet up once he finishes the Northern Ireland golf-walk, flying to North America to encourage 40 prestigious golf clubs to fly the flag from 1 July, Canada Day, to America’s Independence Day on 4 July, followed by South America and Australia tours to visit golf clubs there. Later this year he will embark on a six-week golf-walking pilgrimage along northern Spain’s Camino pilgrimage route, including playing the 4th hole of the Real Golf de Pedreña course, where Seve Ballesteros learnt to play, with Seve’s brother and his long-time friend, José María Olazábal. Nick explains that he wants to have completed four golf-walks by the end of 2019 so that in 2020 and beyond he can focus on other priorities to grow the campaign.